The “year that was” brought mostly disappointment to precious metals bulls. Silver prices fell for the third straight year, while gold mostly flat-lined around the $1,200 per-ounce level. So what about the year to come? On the one hand, the charts looks ugly. On the other, it is rare for any metal to fall in price four years in a row. First, by discouraging new supply from coming on line. In 2014, many miners were forced to suspend operations as gold and silver spot prices fell below production costs. Second, by encouraging more jewelry demand for gold and more industrial consumption of silver. On December 10, the Silver Institute released a report (“ Glistening particles of industrial silver”) analyzing the industrial uses of silver from various sources. Silver is used in batteries, computers, automobiles, cell phones, hospitals, nanotechnology, and solar panels just to name a few. The gist of the report is that industrial demand for silver is likely to increase across the board in the coming years. 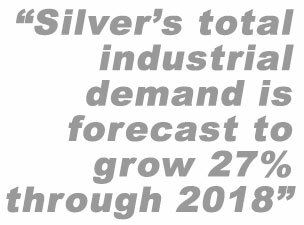 Silver’s total industrial demand is forecast to grow 27% through 2018, meaning an additional 142 million ounces of silver will need to be supplied. It’s doubtful that miners will be willing to grow their silver production at current prices. Another positive sign for metals is the resilient and even increasing demand for physical bullion among investors. Despite price weakness in 2014, which inspired a lot of badmouthing of precious metals in the financial media, silver coin demand hit new records. The U.S. Mint sold more than 44 million Silver Eagles, up from 42.7 million the prior year. At one point last fall, the dysfunctional government mint had to suspend orders because it couldn’t keep up with demand. The ongoing bull market in silver coins should translate into a resumption of the bull market in silver prices in the months ahead. Yes, silver has fallen harder and stayed down longer than most of us thought. But adverse market conditions such as these make for the greatest buying opportunities. The other white metals are also positioned favorably for future price appreciation. The platinum and palladium markets are both projected by metals refinery Johnson Matthey to run a supply deficit in 2015. Palladium’s deficit is expected to grow to more than 1.6 million ounces. That would be the biggest shortfall ever recorded. The value now available in precious metals is especially compelling considering the major alternatives. Savings accounts still yield nothing. Bond yields are still near historic lows. The U.S. stock market is now significantly overvalued by many measures, including its trailing price/earnings ratio of 26 and its 20% premium over total gross domestic product. 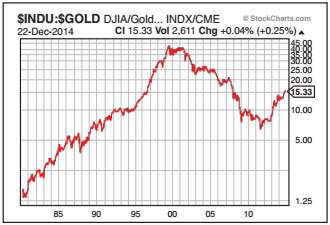 The ratio of the Dow Jones Industrials to the price of gold now stands at more than 14 to 1. For perspective, the ratio got as low as in 6:1 in 2011 and 1:1 at the 1980 top in gold. The ratio has plenty of room to revert back in gold’s favor. Gold looks cheap versus the Dow. When we finally see a major rotation out of stocks and into precious metals, silver has the potential to lead on the way up just as it has led on the way down. The gold:silver ratio moved in favor of gold to a multi-year high of 74:1 in 2014, as gold’s more volatile cousin got hammered. Yet silver mining supply exists at a ratio of about 12:1, suggesting silver has plenty of fundamental room to narrow the ratio and outperform gold. And perhaps vastly outperform stocks. If you own a lot of stocks, now might be an opportune time to trade out of some of your stock positions for gold, silver, platinum, or palladium bullion. You can switch out of stocks and into the physical metal within an IRA without triggering capital gains tax liabilities. You can simply sell your shares and use the proceeds to fund a physical precious metals IRA. 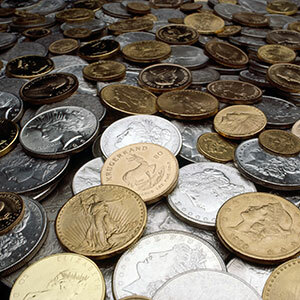 Many prefer to hold physical precious metals outside of an IRA. For beginners, it’s certainly advisable to first establish a core position in your immediate possession. But once you’ve established that, it makes sense to diversify your storage locations to avoid concentrating risk exposure in any one place. One way to do that is with a precious metals IRA, with your qualified metal holdings stored safely in a secure depository.